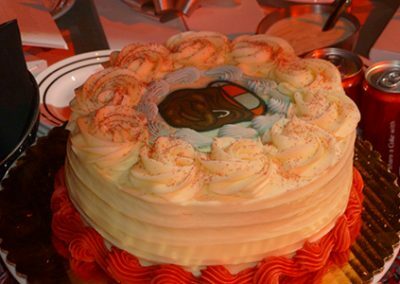 Why celebrate your birthday for just one day, when you can stretch it out over a weekend, a week, or even a year! 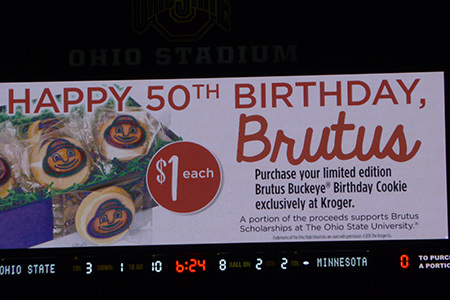 That’s what THE university did for my “son” Brutus on his 50th birthday—a milestone birthday, as my mom used to say. 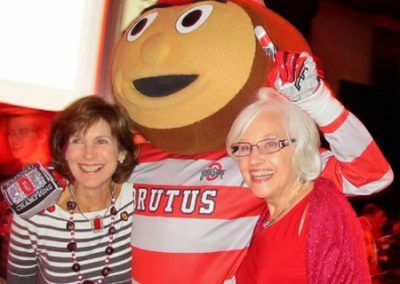 A year filled with Brutus cookies in grocery stores, a birthday cake for Brutus on the Buckeye Cruise for Cancer, and Brutus visits to hospitals culminated in a grand weekend of festivities and frolic. 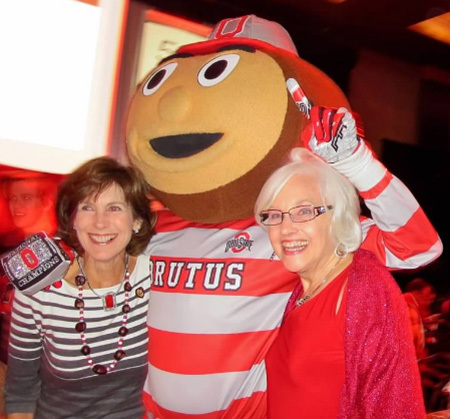 Here’s one person’s account of that fall weekend in 2015. 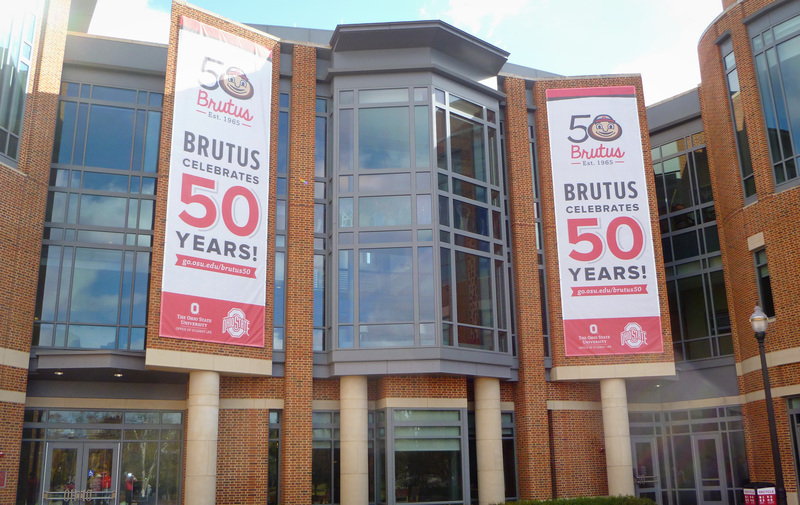 Though Brutus, not yet named, was created from chicken wire, sticks and papier-mâché on the Pi Beta Phi lawn during Homecoming preparations, I guess you could say his official birthday was Saturday, October 30, 1965, when he was birthed to the Buckeye world at the Minnesota-Ohio State game. 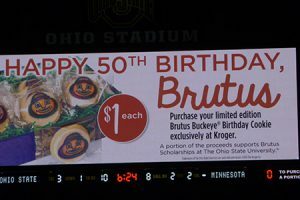 Fitting then, that the Brutus Celebration committee selected Saturday, November 7, 2015, another Minnesota-Ohio State game! The weekend kicked off with a gala celebration in the Archie Griffin Ballroom in Ohio Union. I started to say it was the highlight of the weekend, but really, there were three highlights: the gala, a luncheon reunion of current and former Brutuses, and introductions on the field and halftime with TBDBITL at the game. 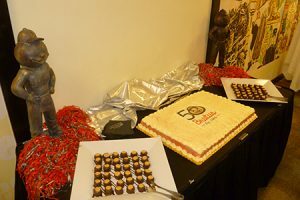 Imagine the Ohio Union being turned into a Brutus Wonderland filled with streamers of balloons, auction tables filled with Brutus and Buckeye goodies, a photo booth for official memories with Brutus and the ball room dressed up with 80 cloth skirted and napkinned round tables with Brutus birthday cake centerpieces, and a stage and big screen nearly as large as the one in the Shoe. 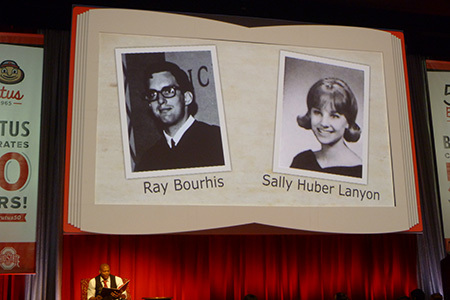 As one of the many honorees that night, my family and I were seated nearly center stage. I’m sure it must have been a delicious meal. 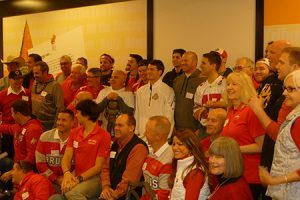 It was just hard to absorb the glamour of the event coupled with reuniting with dear friends who had traveled from various points to share the evening. The “show” began with Eddie George narrating the birth story of Brutus. 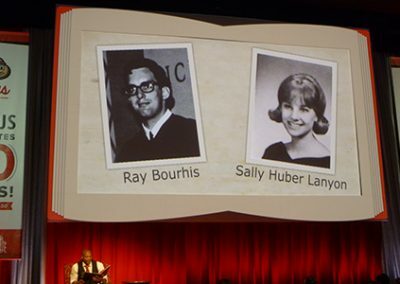 I didn’t mind the college yearbook photo of me in my shoulder length flip on that ginormous screen, but, ouch!, it was hard to watch the video of my wrinkled 73-year old face recounting the story of my part in the original papier-mâché version and more permanent fiberglass model. When they taped me several months earlier, I specifically asked for a fuzzy filter. Someone forgot. The rest of the evening was a wonderful blur of a drumming exhibition by Brutus and the marching band, a return of the fiberglass Brutus (though he was larger than the one I painted), tearful videos of Brutus the do-gooder, Lee Corso’s Brutus heads through the years, and a parade of all the men and women who had spent a year or more of their lives being Brutus. 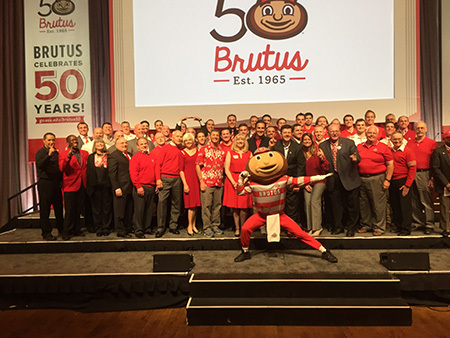 Almost every living Brutus made the journey to Columbus to reminisce and celebrate this weekend. It was heartwarming to meet them. 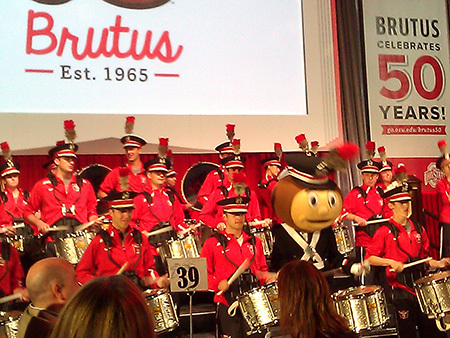 This is when so many of them thanked me for creating Brutus, saying being Brutus had changed their lives. 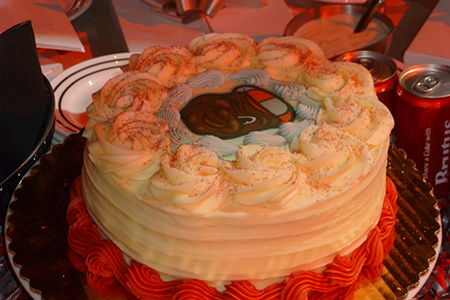 That thought that just wouldn’t go away and has propelled itself into becoming this blog. 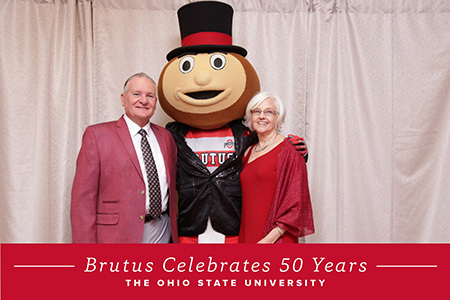 The very best moment during lunch was when Mary Burnett Brown, the second female Brutus, was presented with her original costume from 1981–the only year Brutus had a girly look with a dress sporting a buckeye flower, a red bowler hat, and red and white striped stockings. 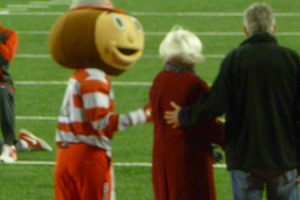 The game actually starts long before kick-off. For those of us who were going to be in the half-time show (including all the former Brutuses), we were told to report to the practice fields by Lincoln and Morrill towers to rehearse with the band. 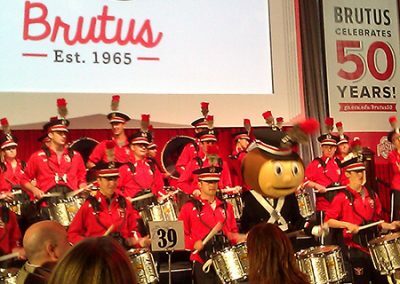 If you are ever in Columbus on game day, make an effort to watch the band practice. 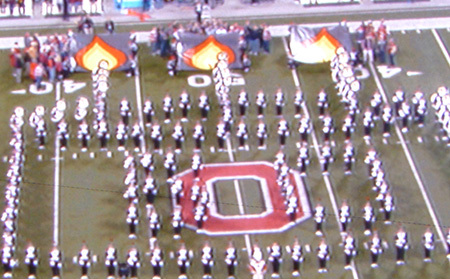 These men and women are just as athletic as the other guys in uniform, and they move in choreographic unison while blowing or drumming nonstop. It’s a wonder they don’t hyperventilate. 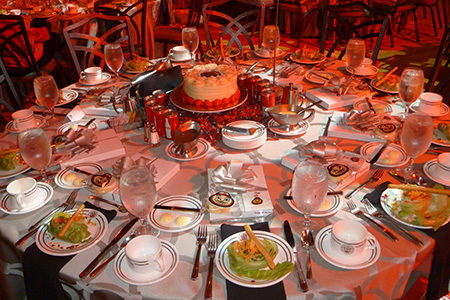 We honorees, in comparison, had a very easy role—stand with our assigned group above one of the three birthday candles outlined by band members while they played, “Happy Birthday, Brutus.” There had been drama all week about whether legal permission to perform the tune would be granted in time. Thankfully, it was. 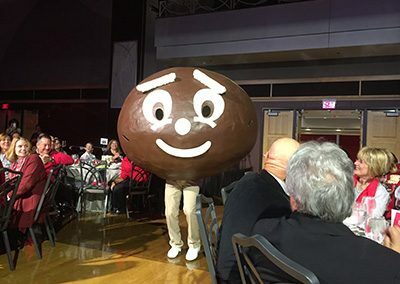 I’m pretty sure Ohio State won the game. I was busy trying to stay warm and paying attention to our “handlers,” the staff who tell you when to go to down on the field to do the queen wave when your name is announced. 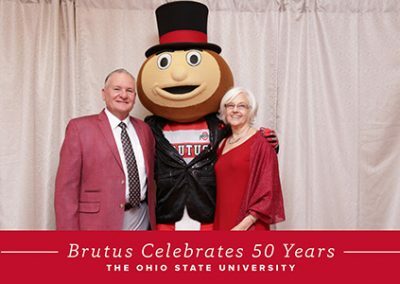 And dear Brutus, he was busy all weekend, too, and certainly well celebrated for the good guy that he is. Still going strong at 50 and beyond. 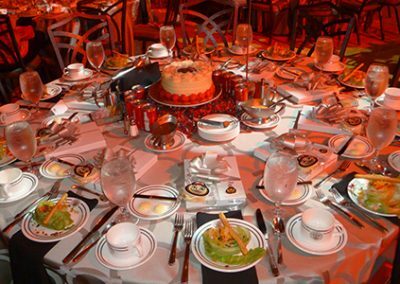 How are you going to celebrate your next milestone birthday?